SECOND FROM TOP:The original entrance to Chaco Culture National Historic Park on New Mexico Highway 57 has been blocked because the vibrations of the cars on the washboard road were causing the ruins to vibrate apart. However, the Park Service has opposed the paving of any of the access roads into Chaco. Some days, Ervin Chavez feels like he's still at war with the Ancient Enemies. Nageezi needs infrastructure. Infrastructure follows roads. 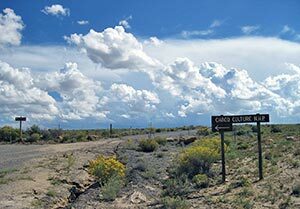 But in Nageezi, all roads lead to Chaco Culture National Historical Park. And the National Park has steadfastly objected to paving the roads, at least without a complete environmental impact statement and the involvement of other tribes who have ties to Chaco. The two main roads from U.S. Highway 550 into Nageezi Chapter are paved for a few miles - "We managed to do it before the Park Service woke up," confides Chavez, the chapter president - but then they rapidly deteriorate. San Juan County, which is responsible for the roads, has put an all-weather surface on County Road 7900, the main access to Chaco, for a few miles past the pavement, but State Highway 57, which would be the shortest route to the park if it were open, is a washboardy disaster after the recent monsoon. "Can you believe you're on a state highway?" Chavez asks as we rumble along at maybe 20 miles per hour, only to encounter a fence across the roadway. Ironically, the Park Service has closed this entrance to Chaco because the vibration from the vehicles on the washboard road was causing the ruins to shake apart. Rather than encourage the state to pave the road, the NPS now reroutes visitors along a combination of dirt roads. But the area is heavily checkerboarded, and some allottees - among them, ironically enough, Chavez' uncle - gated the road and put up "No Trespassing" signs. The present route, which detours around the allotments, is not only jarring but circuitous. "I don't know if it's funny or sad," sighs Chavez. Nonetheless, Nageezi Chapter is scheming with the tribe on developing some sort of "gateway to Chaco" tourism. Chavez says his aunt, who lives on a hill overlooking the park, is constantly having to shoo Europeans in campers off her allotment, so why not have a place where the chapter can welcome them in and charge them? "I think a lot of people would appreciate having a place to stay near the park," he says. Right now, the closest motels are in Bloomfield, N.M., 63 miles from Chaco - and off the reservation. Geri BinettneeKirk, senior economic development specialist with the Navajo Department of Tourism, confirmed in a recent interview that the tribe is very interested in developing the area. "It's a prime area for a small, family-oriented resort," she said. "We've established a little team that is working with the University of New Mexico on the research phase, and we've been meeting with them." As far as the Park Service is concerned, BinettneeKirk suggested the resort might be pitched to the feds as a preferable alternative to fracking, to which the gas-rich Nageezians might resort if there's no other way to harvest income from their land. Name: Oral history has it that a local woman built her hogan close to a field of wild squash and became known as "Asdzaa Nay’z’" (Squash Woman). When the community needed a name to get a post office in 1953, someone suggested "Nay’z’" which the U.S. Postal Service anglicized to "Nageezi." History: This is an ancient Navajo settlement in historic Dinétah, and even before that, the prehistoric Chacoan civilization lived here for hundreds of years. The impressive ruins along the Chaco Wash, first excavated by Richard WetheYUrill around the turn of the last century, became a national monument in 1907, prompting relocation of some Navajo families living at the site and launching tension between the federal government and the locals that persists to this day. The community grew up around the now-closed trading post, next to which the first chapter house was built. In the 1950s, New Mexico Highway 44 (now U.S. 550) was paved, giving residents easier access to both Farmington and Albuquerque (although many of them couldn't use it; horse-drawn wagons were not allowed on the highway and most Navajos traveled on a wagon track running parallel to the road, according to Chapter President Ervin Chavez). Also in the 1950s, the Bisti Oil Field was developed, offering both jobs and mineral lease money to Nageezians, many of whom had allotments, and creating a cash economy. The ready cash had a downside: opportunistic bilagáanas leased patches of state land within the chapter and set up bars, taking advantage of a 1953 law reversing previous legislation that prohibited selling liquor to Indians. "Sad to say, a lot of our people became alcoholics," Chavez said. "I can take you to the Lybrook cemetery and show you so many graves of people who died from alcohol." Today, the oil industry is seeing a revival. Many people also commute to Farmington for work. Clans: Most families here have at least one of four clans in their pedigree: Nakai Diné'e, Nahoobáanii, Bit'ahnii and Tl'ááshch’'’. "All there is here is cousins and second cousins," said Chavez. Famous sons and daughters: Lilly Julian Neil, the first woman Council delegate, elected in 1946 (it was not Annie Wauneka as is commonly believed). According to the Navajo creation story, this area is also the birthplace of the Hero Twins and the site of the first kinaaldá (Changing Woman's). Assets: Gas, oil, Chaco Culture National Historical Park - In its quest to preserve the astonishing ruins of Chaco, the National Park Service has opposed any development around the park, even paving the roads, leaving Nageezi unable to capitalize on its obvious tourism potential. "I would think the vibrations from fracking would not be a good thing for the ruins," she said in a sweet, yet slightly ominous tone. The park recently got a new superintendent, who has met with chapter officials and expressed willingness to work together, says Chavez. Chaco's acting superintendent, Larry Turk, definitely waxed conciliatory in a recent interview. "These are county and tribal roads, off Park Service land, so I really don't think the Park Service should have a say in what is done with the roads," he said. "Speaking for myself, I would like to see a better road, to allow safer travel for both our visitors and our employees." As for development, however, "We would definitely have a concern if it would affect the prehistoric viewscape from Chaco," Turk said. He explained that visitors come to Chaco to gain some experience of what life must have been like for the Anasazi, and to stand at one of the ruins and see a modern hotel would ruin that experience. He agreed with BinettneeKirk that gas development around the site poses the greater threat. Some 38 oil and gas leases could potentially come up for sale outside Chaco in January of 2014, although if the BLM follows guidelines for leaving a five-mile buffer zone around Chaco and not allowing drilling in areas that have wilderness characteristics, that number should be pared down to four, Turk said. Chavez, who has held positions with either Huerfano or Nageezi chapter almost continuously since 1977, is relentlessly optimistic about development in the face of what looks like, even to a not very superstitious person, some sort of Anasazi curse. In the mid-2000s, Nageezi and Huerfano chapters wound up with egg on their faces when a company that had promised them a $12 million egg farm defaulted on its loan - which it had collateralized with $1.25 million in Navajo money. Then in 2006, Nageezi's chapter house burned down, and about that same time an audit uncovered some shady dealings on the part of some chapter officials. Chavez was serving as Huerfano Chapter vice president at the time, but his aunts staged an intervention. "They asked me, 'What are you doing over there when we need you back here?'" Chavez recalls. Chavez was elected Nageezi Chapter President in 2008 and is currently on his second term. "My first four years was all about restabilizing," he says. "I think pretty much everything's back intact. This term I can focus on economic development." The first thing Chavez did, after rebuilding the chapter house and refurbishing a large multi-purpose building with a well-used basketball court, was to strengthen alliances with Nageezi's two neighbors, Huerfano and Counselor chapters. The three chapters strung along U.S. 550 now have "neutral zones" - one between Nageezi and Huerfano and one between Nageezi and Counselor - where residents can affiliate with whichever chapter they wish, and profits from any development will be shared among the three. "I think of them as our extended family," Chavez said. All three chapters have similar problems with checkerboarding, and all three have a major asset in the oil and gas field located underneath them. With oil and gas starting to boom again, Chavez says one thing the chapters - all of which have a lot of allotted land with oil and gas leasing potential - need to watch is the new horizontal drilling method. "The companies say they need it to get into places they couldn't otherwise drill," says Chavez. "But what's to keep them from drilling right into somebody's allotment?" In the neutral zone between Huerfano and Nageezi, the chapters are looking into a convenience store proposed by Navajo Oil and Gas, and a retirement community at the foot of the sacred mountain Dzil-Na-Odith-Hle that would be run by a private non-profit "to avoid what happened at the substation," Chavez said. The police substation Chavez convinced San Juan County to build at Huerfano when he was a county commissioner a few years back is another case of ill-starred good intentions. Approved by the Shirley administration, it was never fully staffed by the Shelly administration once it was built. True to form, Chavez remains hopeful. 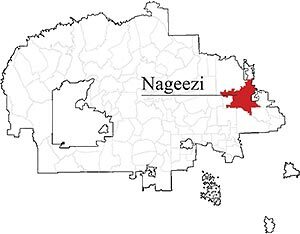 The Navajo Nation Council's recent push toward decentralization might bode well for places like Nageezi. In spite of the lack of pavement, infrastructure development is continuing, targeting the 30 percent of Nageezi households that don't have electricity. The chapter has applied for a grant of 66 off-the-grid solar units from Sacred Power to serve the more remote households - and there are a lot of those in this rugged, wash-cut country. Power line and water line extensions are also in progress; at the moment you can see pipe being laid out for a new water main that is part of the San Juan River water rights settlement. If progress seems painfully slow, it is nonetheless there. Chavez, 60, remembers a time not so long ago when wagons plied these bumpy roads instead of cars, and virtually no one had electricity or running water. "Come back in 10 years," he tells the reporter. By then, perhaps, he will have made peace with the Anasazi.